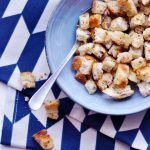 The Best Ever Pan Roasted Bread Croutons, made with goat ghee. They are absolutely divine and gone before you know it 😉 Perfect in soups, as the crunch in salads or as a snack if that’s the mood you are in. Dig out a heaped tbsp worth of ghee, and let it melt in a pan over medium heat, add day old bread cut into little cubes, don’t crowd the bread cubes in the pan. Sprinkle with salt, I used about 1/8 tsp of pink Himalayan salt. Now roast the bread cubes, over low to medium heat, and keep stirring while you keep a close eye on them so they don’t burn. You can of course also use regular ghee if you prefer. Note at some point in the process the goat ghee starts to smell a little goaty….. but trust me they taste divine and not goaty at all. Use your favorite bread or my Easy No Yeast Low Histamine Bread. Day old bread is perfect for making croutons.